picture caption: Lance Clarkson barely survived a December explosion at Washington College Academy that left him critically burned. A few days ago, for the first time since the accident, he began to walk under his own power. Lance Clarkson can walk. By himself. 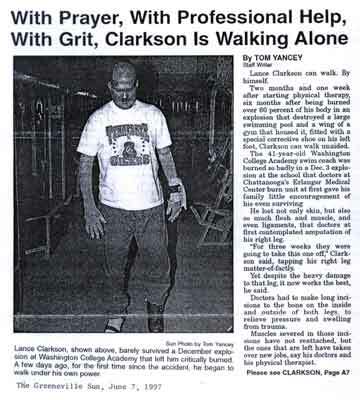 Two months and one week after starting physical therapy, six months after being burned over 60 percent of his body in an explosion that destroyed a large swimming pool and a wing of a gym that housed it, fitted with a special corrective shoe on his left foot, Clarkson can walk unaided. The 41-year-old Washington College Academy swim coach was burned so badly in a Dec 3 explosion at the school that doctors at Chattanooga's Erlanger Medical Center burn unit at first gave his family little encouragement of his even surviving. He lost not only skin, but also so much flesh and muscle, and even ligaments, that doctors at first contemplated amputation of his right leg. "For three weeks they were going to take this one off," Clarkson said tapping his right leg matter-of-factly. Yet despite the heavy damage to that leg, it now works the best, he said. Doctors had to make long incisions to the bone on the inside and outside of both legs, to relieve pressure and swelling from trauma. Muscles severed in those incisions have not reattached, but the ones that are left have taken over new jobs, say his doctors and his physical therapist. Clarkson said that his doctors tell him that, in some places, rigid scar tissue has taken over, the function of ligaments, allowing his leg muscles to, for example, extend his foot downward, which is essential for walking. "I don't have any Achilles tendons, yet I can walk. Science said it is impossible; watch me," he said, as he walked from one exercise machine to the next, smiling. "God is good," Clarkson said midway through his physical therapy session Friday afternoon at Apple Rehab in Greeneville. He said his doctors tell him that, if his left ankle continues to improve as it has in the last two months, surgery that had been planned may not be needed, although he still faces plastic surgery on his hands, and possibly on his left elbow. Clarkson's strong Christian faith has played a major role in his response to the accident, and he is quick to give credit for his survival and recovery to God, along with the prayers of his family, friends and the community. He and his wife are active members of First Baptist Church. He is also the son of the Rev Rowland Clarkson, rector of St James Episcopal Church here. "If I can get everybody in Greeneville to pray, I won't have to have surgery," he says, only half-joking. He also credits his Chattanooga physicians and his local physician, Dr Thomas Beckner, along with Greeneville Orthotics, which have made his corrective shoe, and Apple Rehap, where he does physical therapy daily. At one point Clarkson considered staying in Chattanooga for special burn-related therapy, but he said he learned that everything he needed was available locally. "This place (Apple Rehab) is wonderful, and the people who work here are outstanding," Clarkson siad. "They're always smiling, and positive to any progress. Even on a 'down' day, they make you feel up," he said. That works both ways, apparently. Tammy Andrews of Apple Rehap says, "It does humble you", just to be around someone like Lance, who maintains a great attitude despite many physical problems. "Lance works pretty hard, and we work him hard," said Tony Villanueva, the Registered Physical Therapist who has been working with Clarkson for nine weeks. "Every day it's getting better." Villanueva said working with Clarkson is very satisfying because he can see that the physical therapy is helping. Villanueva works frequently with accident victims and people who have had serious injuries. But, he said, he has never worked with someone who had so many serious injuries as Clarkson. And in terms of attidude, he says, "I wish all my patients could be like him." Clarkson says simply, "You gotta want it," then grunts through another exercise. The first week, Clarkson could only do stretching exercises, but now he is working on eight therapy machines, stretching both his ankles, his legs, hands, and wrists, and doing strengthening exercises for his upper and lower extremities, and abdomen. He looks forward to the next to the last exercise each day, after which Villanueva massages his shoulders and pushes them forward, something he cannot do himself. "That feels great," he says. He least likes his finger stretches, but on Friday, Villaneuva said, he made real progress because Clarkson was deep in conversation and was able to ignore the pain longer than usual. Clarkson must see a plastic surgeon about his hands in July. Clarkson said he decided to quit using his walker a week ago Friday night after the awards banquet at Washington College Academy, a private school founded in 1780 which is located near Limestone, in Washington County. The next morning, Clarkson walked from the academy's library to the auditorium, along with the faculty and graduates. "I held them up, but they waited for me," Clarkson said. The WCA graduation crowd gave Clarkson a standing ovation. His special corrective shoe has helped turn his foot back out to a nearly-normal position. He has only limited motion in his right hand, and his right elbow is fused because of hypertrophic ossification, or bone formation. Clarkson can, however, grip well enough with his left hand to manage a hearty handshake. Much padding is required for some exercises, "because I'm just skin and bones" in places, Clarkson said. Villanueva must attach a hook to Clarkson's wrist for some exercises. And when he flexes himself out of position, Villanueva must reposition him. At home Clarkson still needs plenty of help for almost everything, but his wife, Judith, or his mother, Germaine, takes up plenty of slack. He describes his appetitie as "Great!" and adds, "I eat too much." The Greeneville Sun (Greeneville Tennessee) 7 June 1997.